John Kaganga and his Kikandwa Environmental Association young farmers, also known as his children. John Kaganga is transforming the lives of rural youth. The retired teacher is inspiring young people to pick up their hoes and build a brighter future in Kasejjere village, 70 kilometres northwest of Kampala, Uganda’s capital city. To respond to these problems, he founded the Kikandwa Environmental Association, or KEA. With a garden hoe in one hand and a notebook in the other, Mr. Kaganga encourages children and young adults from seven to 30 years of age as they farm. The 59-year-old teaches his “class” to use farming as a way to achieve food security and tackle climate change. The now-fertile farmland on which Mr. Kaganga teaches young farmers was once used for slash and burn agriculture. Farmers cleared all vegetation to create more space to grow crops. But many struggled to put food on the family table. There are 200 households and nearly 1,000 residents in Kasejjere village. More than 100 young farmers have joined KEA, including some of Mr. Kaganga’s eight children and ten grandchildren. Claire Nakate is Mr. Kaganga’s granddaughter. The 14-year-old is in her first year of secondary school. She wields a hoe as she digs in the family farm alongside two brothers and four helpful friends. Mr. Kaganga thinks young people should turn to farming to create their own jobs. He says farming can have a huge impact on food security and the environment, if young people are taught sustainable techniques. KEA is supported by Eastern and Southern Africa Small-scale Farmers Forum, or ESAFF, which helps to train many small-scale farmers in Uganda on sustainable agricultural practices. 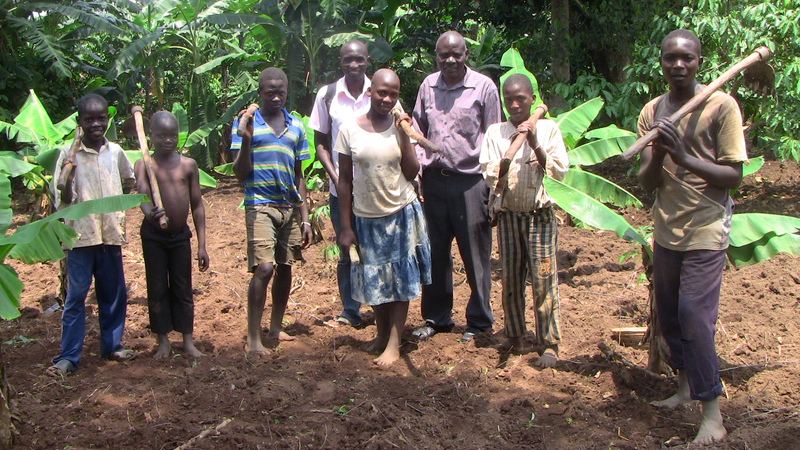 Mr. Kaganga has helped Kasejjere become a model farming village. He has also established a community resource centre for young people to prepare for a successful future in agriculture. KEA’s library houses books on sustainable agricultural practices, environmental issues, and climate solutions.